This winter has been a great time to curl up with a good book on gardening. I hope Santa Claus or whomever brought you good garden books to read in preparation for your own spring gardening. I am so delighted to have received this fantastic book of 80 essays on gardens and flowering plants. A book that is not only interesting to read once, but one that is a fantastic source of information to own. 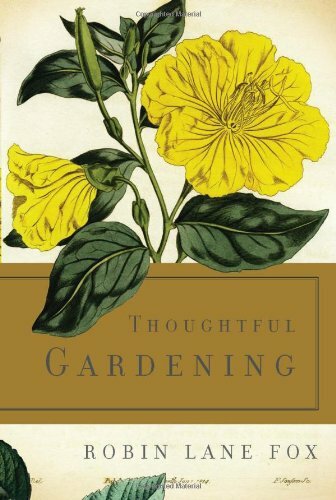 If TheGardenLady’s British readers have not read “Thoughtful Gardening”, I especially recommend your reading it. The author, Robin Lane Fox, is one of Britain’s foremost gardening expert. He says he has always loved gardening, His first gardening job was at the Botanical Garden in Munich which, for those with an interest in alpine flowers, “is recognized as the supreme alpine garden in Europe.” He has written garden columns for the British newspaper “Financial Times’ for forty years-” the longest running in print today.” He is also Garden Master at New College, Oxford and gardens in his own two acre garden. Besides all this, Robin Lane Fox is a scholar of classical history and teaches this at Oxford. He has written numerous books on classical history. He sounds like a Renaissance man to me. His “Thoughtful Gardening” book includes plant references to flowers in history and literature. Another part of the book that I am enjoying is his information about some of his favorite public and private gardens.This garden lady enjoys touring gardens in every state in the US that I visit or wherever in the world I travel and Robin Lane Fox also seems to enjoy visiting gardens. One of his favorite gardens in the US is Longwood Gardens. Robin Lane Fox writes of many of TheGardenLady’s favorite gardens in England like the Great Dixter and Wisley Garden as well as gardens that I hope to visit. I had met Helen Dillon at a symposium and saw slides of her garden. Someday I hope to visit her garden. His book has some humorous essays. For example, TheGardenLady did not know that the UK is plagued with badgers. Robin Lane Fox has a hilarious essay on feeding his nemesis Prozac-laced peanut butter. It sounded to me that if the badger could speak, he would have thanked Robin Lane Fox for the treat. The “Thoughtful Garden” book has a great list of references. But I don’t always have room in my luggage when traveling to bring anything extra with me. I usually don’t carry books. So one thing that TheGardenLady does to get to know a place better, as well as to learn what businesses are in an area, especially plant nurseries, is to check out the yellow pages in telephone directories or online at my hotel. So for example, when I was in London, I read the business directory in London to get a feel for garden centers I might want to visit. Places that I think the locals use where I as a visitor might find interesting and relatively inexpensive gifts to take back to gardening friends. For a good review of the “Thoughtful Gardening” book check out this site.